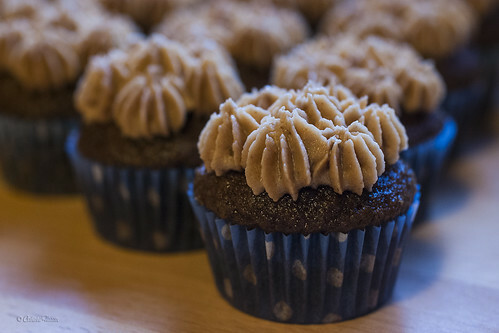 Chocolate “Elvis” cupcakes | SMØRGÅSBORD! 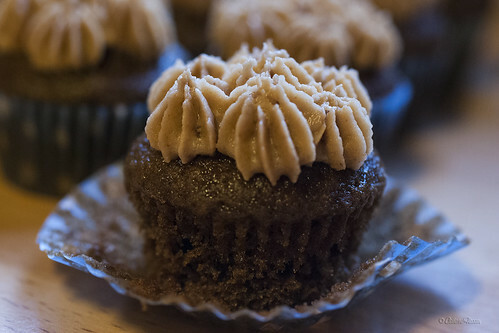 * Apparently, the cupcake was called «Elvis» because Elvis Presley liked to put bananas on his peanut butter sandwiches… But since I liked to put cheese (yes, you read correctly: cheese!) in my chocolate peanut butter sandwiches as a kid, I thought I could make a chocolate «Elvis» cupcake (adding cocoa powder to the cupcakes, besides the bananas) with a chocolate and peanut butter cream cheese frosting (adding cocoa powder and cream cheese instead of just using regular peanut butter buttercream). In a medium-sized bowl, sift together the flour, cocoa powder, baking soda and salt. Set aside. In the bowl of an electric mixer fitted with a paddle attachment, mix together the mashed bananas and the sugars until combined. Next, add the oil, the eggs, sour cream and the vanilla extract to the banana mixture. Beat at low-medium speed until just combined. Finally, add the rest of the dry ingredients (the flour-cocoa mixture) in 2-3 batches. Mix at medium speed until well-blended. 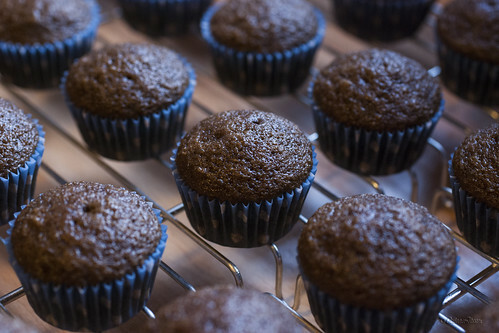 Line 2 mini-muffin pans with baking paper cups (or muffin forms). Fill each cup 2/3-3/4 full with batter. 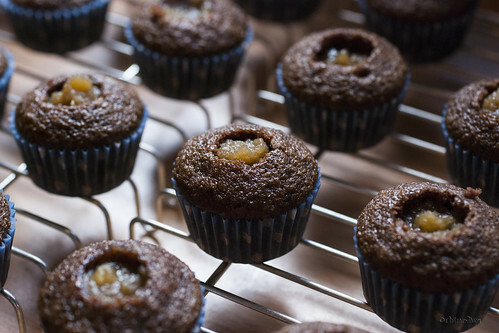 Bake in the pre-heated oven for 18 minutes (10 minutes for mini-cupcakes), or until a toothpick inserted near the center comes out clean. Add the sugar and the bananas. Stir until all the sugar has melted. Transfer the filling into a glass bowl (or any other suitable container), and set aside to cool. * You can puree the banana filling in the food processor, but I liked having some chunks left here and there so I did this by hand using a fork. Sift the cocoa powder together with the powdered sugar into a bowl. Set aside for later. Turn the speed to «low», then gradually add the cocoa-sugar mix. Beat until thoroughly combined. Make a hole in the center of each cupcake. Fill the hole with the prepared caramelized banana filling. Optional: plug the filled hole with the cupcake part you removed to make the hole.